With type 1 diabetes, it is easy for blood sugar to end up higher than it should be, as there are so may factors that affect it. I often say to people, "I can't come anymore, my blood sugar is high" and I get the impression people feel this is an excuse I use to get out of things, when in reality I feel so unwell. Sometimes I can still carry on when my blood sugar is high, but often I get so exhausted that I have to rest and recuperate. When a person with diabetes has high blood sugar, it can feel so awful and draining, and it can feel embarrassing when it prevents you from doing things, but you have to respect my bodies limitations. 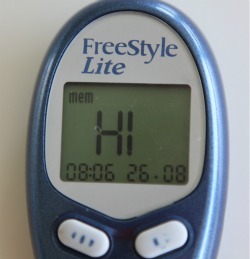 When my blood sugar is higher, I am always shocked by how thirsty I become. Think about being really dehydrated after exercise, but every time you quench your thirst, the feeling comes back after about ten minutes. Long bus journeys, long university lectures, with no access to water, are absolute torture. I normally carry about with me a litre water bottle with me just in case my blood sugar ends up higher. The excess thirst is also accompanied by increased urination. A trip to the toilet is needed every half an hour, even a simple shopping trip can get interrupted by having to find a toilet that can be used. The biggest thing for me is the fatigue that I get when my blood sugar is high. I could have slept perfectly the night before but feel so tired the whole day. My whole body feels tired and heavy, and it takes so much effort for my limbs to complete tasks. Everything I do takes so much thought and effort. My mind feels tired, and I can't concentrate on anything. If I try reading a book, I'll read a couple of sentences, then forgot the sentences and have to go back and try and take in the information. That is why I found university harder at times. That is also why I have become a master at the famous student afternoon nap, because I am so tired due to high blood sugar! Another bad symptom of high blood sugar is the effect it has on my mood. I become so emotional, so the slightest thing would make me upset. If I am watching something on the television and a happy event happens, I will start crying randomly. I also become extremely irritable. I asked my mum how I act when I have high blood sugar and she said "When Alyssa's blood sugar is high, she becomes stroppy and argumentative. She will not do anything she doesn't want to do!" This is after asking her to be nice about it! The tiniest thing will annoy me, and I will get angry about it. My whole personality changes, and I can't control it, and it is really difficult to explain to people that it wasn't me who snapped at them, it was only because my blood sugar was high. High blood sugar is short term, but can have long term effects on the body (which I personally try not to think about). It is extremely hard to carry out simple tasks, and for me, when my blood sugar gets higher, I am not in the right frame of mind often to correct it, due to the mood change associated with high blood sugar. It is a hard cycle as well, because if you correct your blood sugar with too much insulin, you can often go the opposite way and have low blood sugar, which in turn presents a different problem. Living with type 1 diabetes is harder than it seems. This time last year, after a lot of consideration, I declined my offers to study nursing at university. At the time, I was suffering from hypoglycemic seizures more often, and was advised that I may not pass the occupational health check that is required when working as a nurse. Even though I never actually failed the check, I decided, bearing in mind that these hypoglycemic seizures may take a regular appearance my whole life, that I would try and find another path, so that I wouldn't have to fight my entire career. I understood why I might be able to work as a nurse, someone could be in my care and something could happen to me, putting them in danger, it is just hard to swallow that my type 1 diabetes was holding me back. Soon after I applied to this course, I got another opportunity. I was a finalist in the Young Scot Awards, and at the award ceremony, St. Andrews University announced that anyone who was a finalist would be offered a place at their university. I followed this up, and went to a meeting with them. They said they could offer me a place there, and so I was left with a decision. Should I go to such a prestigious school as St. Andrews, or should I go to Dundee and study a course that I was genuinely interested in. Again this was such a hard decision. In the end I choose Dundee, because the course was more work-based, and I felt that fitted me more. I was honored to have such options about where to go next after months of being so confused about what to do next. The end of school, and the start of university was such a hard time for me. Leaving the safety net of school and actually having to decide what I wanted to do next was incredibly difficult, but I feel I have made the right decision. Things haven't been so smooth sailing over the past year, with moving away and having to discover how to live by myself, meeting new people, starting a new job, the learning curve was incredibly steep and at times I have been overwhelmed., however I have passed first year of my course, Community Learning and Development, and have hopefully found my future career. In terms of my type 1 diabetes while I have been at university, things have been tough. I do still have seizures, the new routines have sometimes been difficult, and this is something I still do need to get to grips with, but on the whole I feel it was a good move. I can't imagine how different my life would be if I had pursued nursing. Looking back, I was so stressed for ages because I had no plan. It just goes to show that things do work out in the end. P.s http://www.pumptasticscot.co.uk/2016/04/nursing.html This is a blog post I wrote over a year ago, explaining my decision for declining my nursing offers at university.